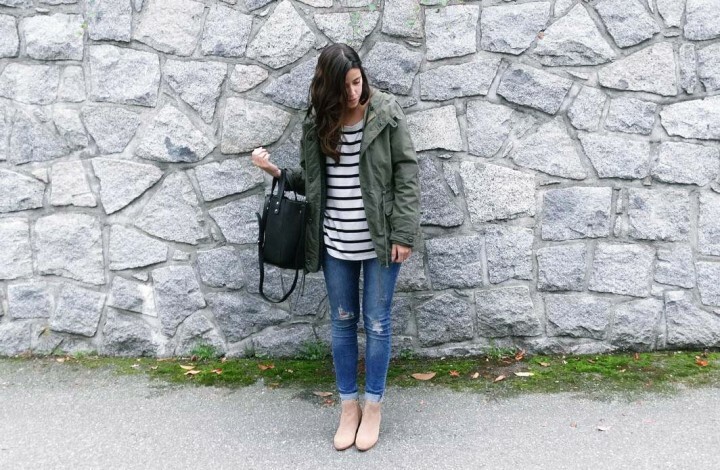 Carolina is wearing Aritzia parka, Club Monaco top , H&M jeans (similar), Aldo boots (similar) & Mini Tote bag. Lately I’ve been researching winter clothes and essentials to buy for the new season. Although I’ve made a minimalism pact, I haven’t stopped investing in timeless, good quality pieces. A fall-winter perfect parka is one of those pieces. Buying a parka coat should be an easy task especially as there are hundreds of options out there and so many different styles. But somehow this doesn’t make our jobs easier, as in fact having multiple options makes it even harder to pick! The style: Choose from trench-like, cropped, poncho-style, fur-trimmed, straight or over-sized parkas. Choosing a style that fits you best depends a lot on your body-shape and on your style. If you are petite, like me, try to buy one size down if you are going for an over-sized, loose look. Topshop or J Crew have plenty of petite-style parka coats usually. The thickness of the parka coat: Do you want it to be like a lighter fall jacket or a winter coat? Go for padded options that have detachable vests and fur hoods. This way you’ll get the more versatile coat and a 2-1 style that you can wear regardless of the season. The length of the coat: From cropped options to knee length styles, parkas usually comes is various lengths that fits the season or the place you are most likely going to wear them. Go for shorter styles if you are buying a parka for warmer fall days and choose a longer style, that serves as a cozy option for your winter outfits. The occasion you are buying it for: Although not an actual “occasion”, knowing where you’ll wear the coat most will give you a better picture of what you are looking for. Waterproof options are better if you are planning for great outdoor escapes, or looser options are good for layering with your work outfits. Check out some of our favorite parkas for the season! Building your minimal season wardrobe ? Bracelets 2.0 – When have bracelets become handpieces?